down from above Earth’s north pole. Tomorrow evening, at 9:26pm South African time, an asteroid will shoot past Earth, missing us by under 28,000km. As usual, the astronomy press dance the fine line between “This is really Exciting!” and “Don’t worry, it won’t hit us and you probably won’t see it so stop getting so excited”. Still, it is the closest flyby of any asteroid that large, so it’s definitely worth a mention. 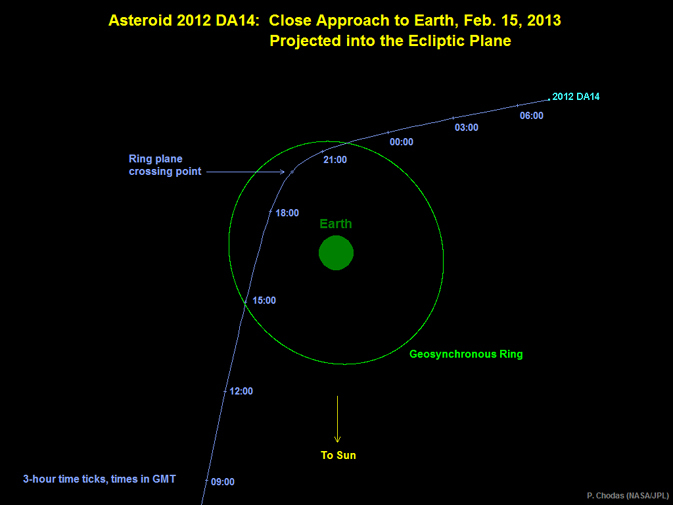 Asteroid 2012 DA14 is, by astronomical standards, a tiny speck of space dust. It wouldn’t be important at all, except that it will pass so close to the Earth that for a little while it will be nearer to us than most of our communications satellites. That tiny little dish outside your house, receiving a satellite TV signal? That communicates with a satellite that’s 50% further away than 2012 DA14 will be. But the perspective shifts somewhat from a human scale: the asteroid is actually a huge stinking boulder, a solid clump of rock and metal some 45 meters across that could almost cover half a rugby field. It has a mass of about 130,000 tonnes and will be moving at a speed of over 28,000km/h. If it were to hit Earth, the force of the impact would be just like a large nuclear weapon exploding, without the radiation. Luckily, the “small” distance of 28,000km is still more than double the diameter of the entire Earth! So whether the miss is close or wide depends entirely on your perspective. Incidentally, the prospectors at Deep Space Industries (real life asteroid miners who’re just itching to get their first crew of miners out into space) reckon that the mineral content of this asteroid has a street value of about $195 Billion, assuming that flooding the market with such a volume of metals doesn’t affect prices. Want to see it? It’s going to be hard, because even at its closest point, it will still be too small and faint for the naked eye. A decent telescope can handle that, but targeting will be a nightmare – it’s whipping by so fast that it will take considerable experience and skill to get it in your field of view. Your best bet is a good pair of binoculars, but even then you’re going to need a finder chart for your location, because at that distance, it makes a real difference what city you’re in. If you know your precise location (read from your GPS, or find your home on Google Maps), you can get one from http://www.heavens-above.com. Otherwise, NASA TV will be covering the flyby in real time, complete with commentary, animated simulations and (weather permitting) live views through telescopes in Australia and Europe.